Omg heaven in a square!! All you need to do is take plain chicken breast and add 1 square. I tried the garlic and herb one tonight and it was amazing. My boys and boyfriend just loved it. For the size of the square and the amount of sodium, cholesterol, and fat it has, it isn’t bad at all. 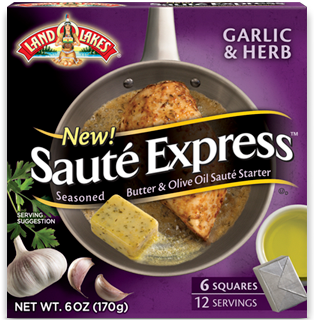 I made chicken breasts tonight with the Sautee Express. Fresh green beans with red onion in a little bit of I Can’t believe it’s Not Butter, and fresh garlic(salt and pepper to taste). I also made homemade mashed potatoes BUT I put in mayonnaise because it is low in cholesterol and gives you a better flavor without having to add all that salt and butter in. You can also use chicken bullion in your mashed potatoes if you want to go super healthy.